Enjoy this nicely redone and upgraded family retreat in Solana Island Resort! Home boasts wonderful Star Wars game room, kids themed bedrooms and comfortably appointed King and Queen Bedrooms. Relax at the comfortable private pool and spa lanai area of this well appointed home or walk down to relax at the stunning pool area and clubhouse amenities that this great community has to offer. 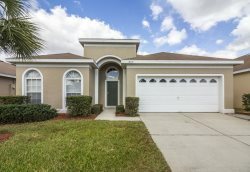 Home is located only a short 15 to 20 min drive (or 13 miles) from most Disney Parks and on the easy side of traffic. Shuttle service to area attractions can be arranged through this resort.